Numbers for iPhone and iPad is a great way for casual users to manage spreadsheets but may not offer enough power for professionals... yet. 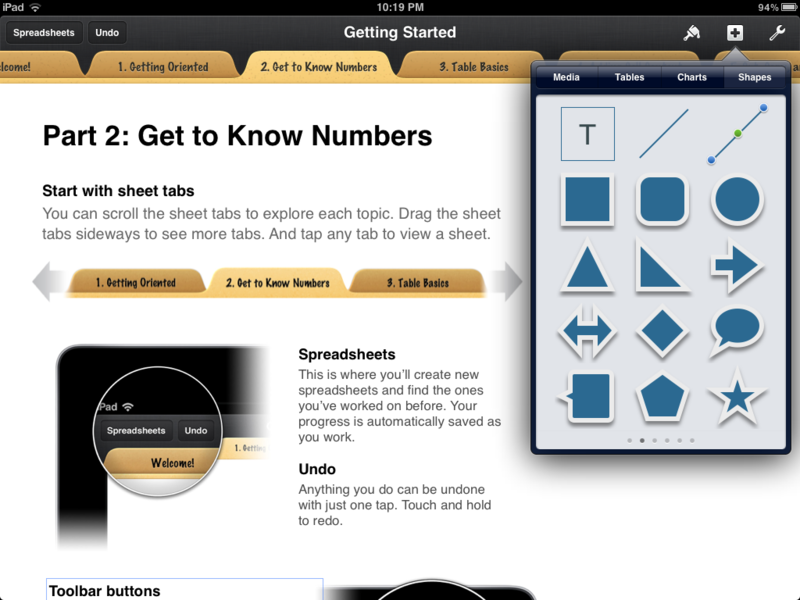 Apple's Numbers is the spreadsheet component of their iWork productivity suite of software, and a companion app to Pages for word processing and Keynote for presentations. Universal apps that work on iPhone, iPod touch, and iPad, all three have proven to be popular choices for document management on the go and have just recently been updated to support for iOS 5.1 and the new iPad's Retina display. If you're a new iPad or iPhone owner and need a way to create and edit spreadsheets on the go, Numbers is Apple's iCloud integrated solution. The question is, how easy is it to use and how much can you really do with it? Apple's Numbers isn't Microsoft's Excel. That's the first and most important thing to remember. Apple's goal wasn't to copy Excel, Lotus, or Visicalc, but to come up with a spreadsheet program that was easy to use and could produce great looking documents fairly quickly. That said, if you've used Excel in the past, you should feel pretty comfortable with Numbers as well. To add content to a spreadsheet in Numbers -- whether it be text, a table, an image, or something else, you simply tap on the Add button (looks like a + sign) in the top right corner. 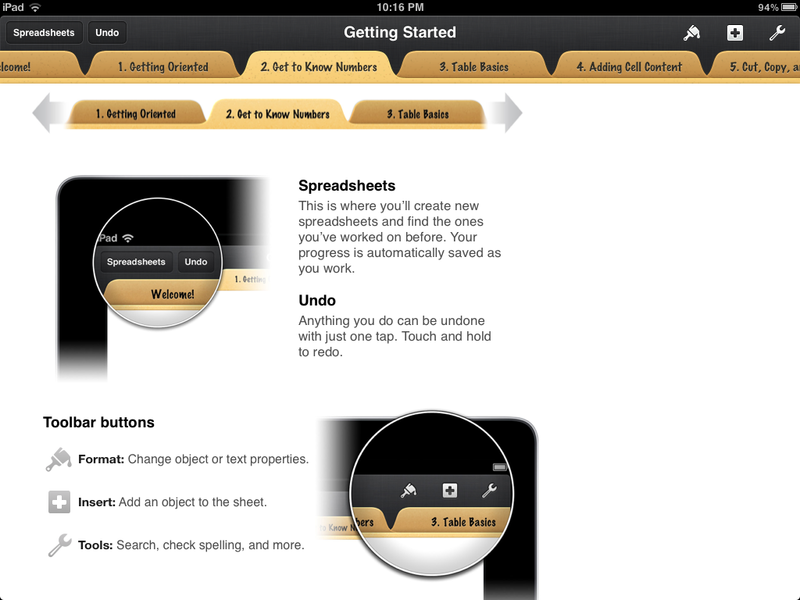 Once you add an object, you can move on to editing and formatting it. Numbers also makes it easy to format content with the formatting brush. It's represented by a paintbrush icon in the upper right hand corner. In order to use it, you'll need to highlight something you'd like to format. From there it will smartly choose options based on what kind of content you'd like to edit. For example, if you select a table full of data, it will give you the option to turn that data into charts or graphs quickly and easily. If you're selecting a block of text, it'll give you options for format that text as a header, change the font, place borders around it, and many more options. If you've used past versions of iWork on your iPhone or iPad, you may have noticed that the formatting icon and menu have changed a bit in the updated version. Numbers gives you a few ways that you can share your content directly from your iPhone or iPad. You can share your work via e-mail, send it to iTunes (where you can open it via the desktop Numbers app for Mac), and print it. 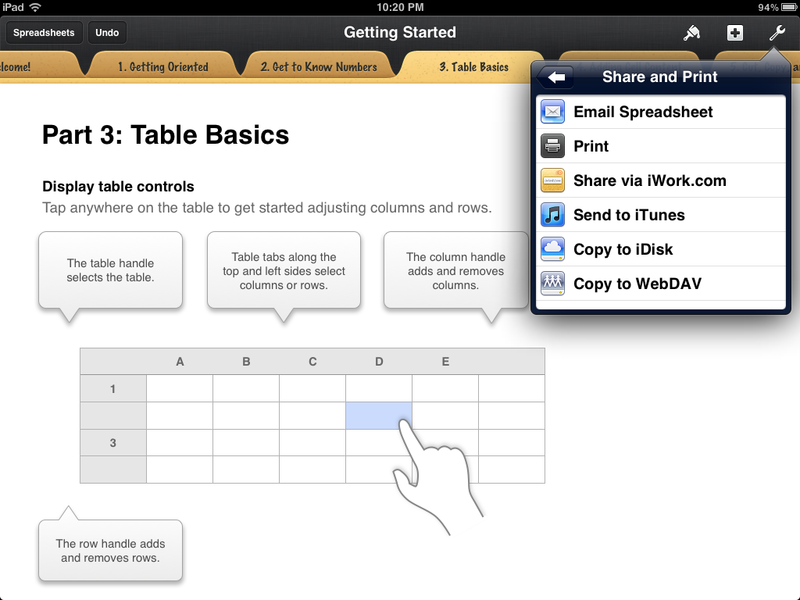 Currently Numbers still gives users the option to share it to iWork.com or iDisk as well. Given iDisk and iWork.com will be discontinued this summer, I'm not quite sure why Apple is still allowing them as options. I'd advise new users to stay away from them and just enable iCloud from the beginning to avoid having to transfer documents over before Apple turns off these services. Upon first launching any of the iWork for iOS apps on your iPhone or iPad, you'll be asked whether or not you'd like to sync with iCloud. I'd recommend doing so if you plan on editing and accessing documents from multiple iOS devices. 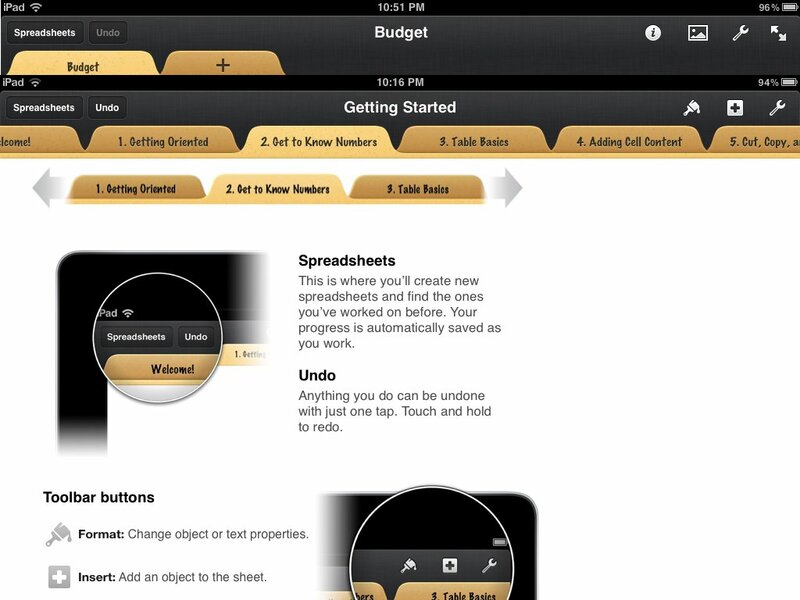 This way, if you make changes to a spreadsheet on your iPad, your changes will be synced with all your devices. There are, however, a few flaws to this system. I'm not a fan of the fact that I have to log in to iCloud from a browser and download files and re-upload them when at a computer. I was really hoping Apple would have implemented a better solution by now. If you only have the need to edit iWork documents on the go, iCloud is just fine but we have to be practical -- most users need to be able to easily edit them on a computer whether in iWork on Mac or Microsoft Office on Windows or Mac as well. The integration just isn't that great when you've got to download a document from iCloud, edit what you need to, and re-upload it in order for it to sync the current version to all your devices. A syncing solution that better integrates documents with iCloud will hopefully be a big part of what OS X Mountain Lion will bring to the table. While iCloud does allow you to download documents to your computer in Excel format, there's no escaping the fact that Excel and Numbers handle some types of data differently. If you use a lot of extensive or custom-built formulas, switching between Numbers and Excel probably isn't too pretty. I've come across a few occasions where I'd created extensive formulas or functions in Excel or Numbers and when I'd try to cross-edit, the formulas would break or output an error. This has a lot to do with how each handle formulas and syntax. Unfortunately, it's probably not something Apple can overcome easily. Numbers 1.6 is a free upgrade to existing Numbers for iOS users, and comes with a few new features. Anyone who previously used iWork on the iPhone or iPad may have noticed that some of the main interface elements were switched around. I've found the new layout to be much more productive than the old one. The main controls have been brought down from four to three. Within these three sections, you'll find a lot of your options have been condensed or re-organized. The new layout took me less than 10 minutes to get used to and where I logically thought something would have been moved was typically where it ended up. Existing users won't need to worry about re-learning the program and new users will benefit from the more intuitive layout. One of the most talked about features in Numbers 1.6 is the ability to easily add 3D charts and graphs to your spreadsheets. While the 2D charts were good enough for most, the 3D charts really do make spreadsheets created in Numbers pop. Let's face it, no one really likes staring at spreadsheets during a meeting or presentation for very long. It's essential that you have a way to convey your information in a way that's fun and engaging. I find the 3D charts and graphs to be a way to do exactly that. Once you've got your data set up in a plain text chart, Apple has made it drop dead simple to turn that data into an easy to read 3D pie chart or graph. 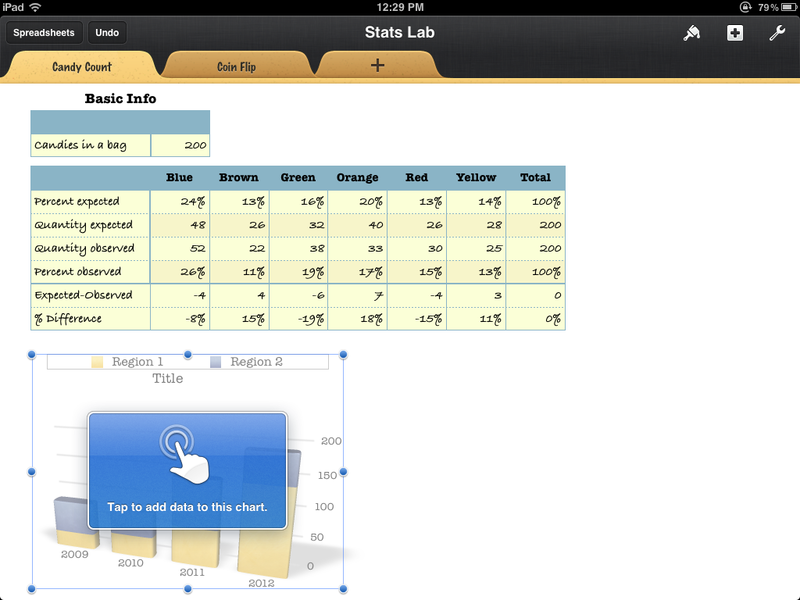 To add a chart to a spreadsheet, tap the "+" symbol to add an element and choose 3D charts. From there you can highlight the content from your spreadsheet you'd like to appear in the chart and you're done. Customizing and editing things like color, font, what data to display on what axis, and other design elements is easier to access with the new formatting icon (hint: it's the paintbrush in the upper right hand corner). You can also drag individual contents around such as the title or chart key for easy placement and adjustment. While the addition of 3D charts and graphs is welcome, the thing I was most happy to see in action were the stability and performance improvements. I'm normally pretty skeptical of companies releasing an update with a generic "performance enhancements" description. This time, it really is noticeable. I've always found the interface of Numbers on iPhone and iPad to be somewhat difficult to work with as it always seemed to lag behind. I'd attempt to highlight a few cells and the cursor could sometimes not keep up with my finger. This seems to be less of an issue this time around. If you're working with spreadsheets that contain a lot of data it could always be rather tedious to use your iPhone or iPad to edit them or make changes. I always experienced lag. With smaller spreadsheets that don't contain a tremendous amount of data or formulas, it's probably a non-issue for most. Using my iPad 2, I do still experience some lag when typing content into cells and trying to switch between them. Sometimes I find myself having to tap twice in order for Numbers to realize I'm trying to switch between cells. I tested out Numbers on a first generation iPad and unfortunately, a lot of the lag still seems to be present. 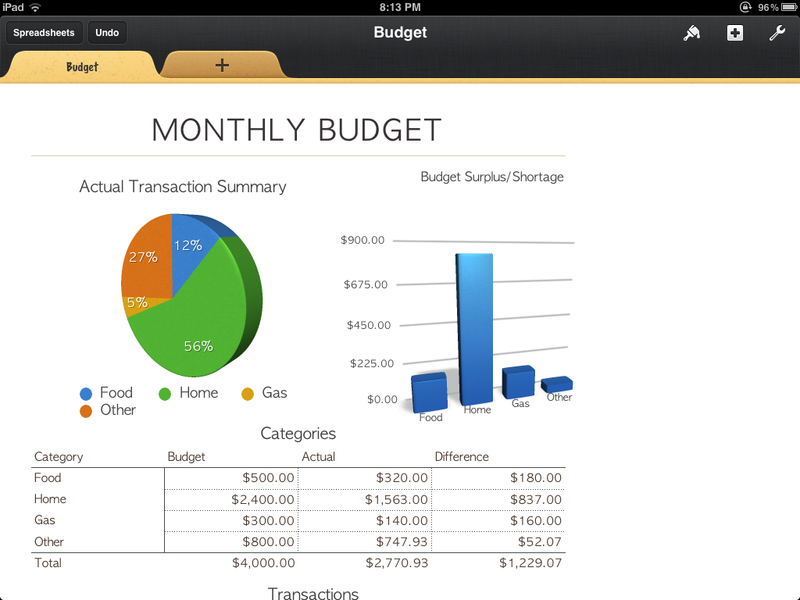 It'll be interesting to see how the new iPad will handle large spreadsheets. Numbers for iPhone and iPad is a great way for casual users to manage spreadsheets but may not offer enough power for professionals... yet. The power of the Apple A5X processor in the new iPad will no doubt make handling larger spreadsheets smoother and easier, and the Retina display will make them look better than ever. Aside from some minor improvements, however, I really don't feel iWork received as much attention as the iLife suite this time around, namely GarageBand, iMovie, and the all new iPhoto for iOS. 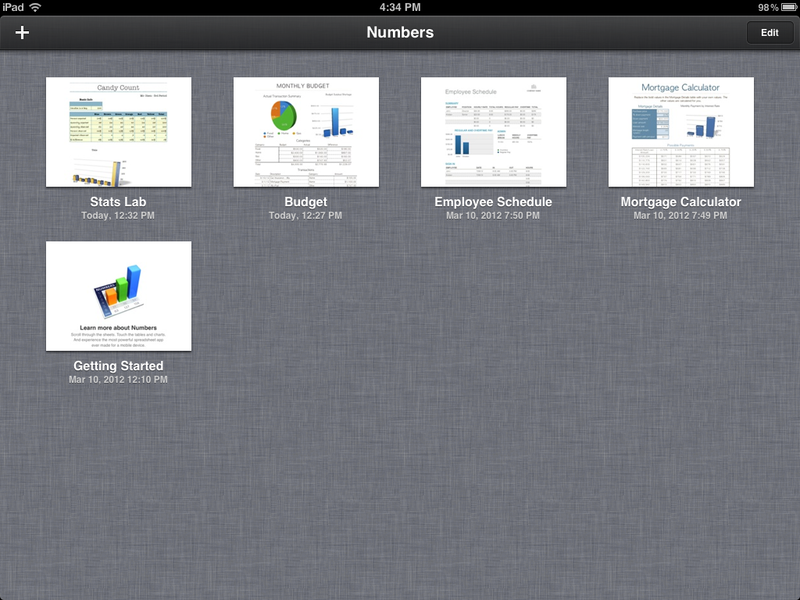 Numbers 2.0 should be a priority for Apple if they want the iPad to continue to convert people to mobile productivity. In the meantime, I'll continue using the current Numbers for basic spreadsheets that I need access on the go. It will also be interesting to see what, if anything Microsoft brings to the table if they decide to pull the trigger on Microsoft Office for iPad.